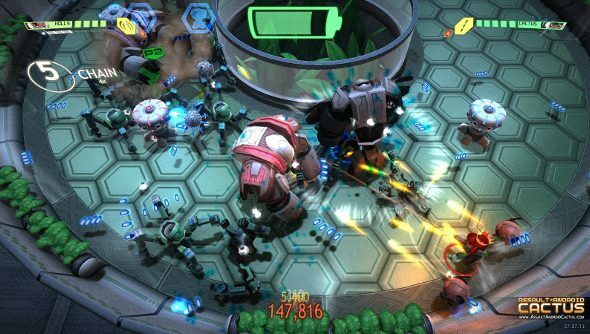 I haven’t played Assault Android Cactus in over a year, not since seeing it at a GDC party in 2014. But this trailer is a good time to remind you that Assault Android Cactus is an awesome twin-stick shooter and I suspect a lot of people are going to fall in love with it after it comes out. Check out this trailer to get a taste of what’s headed your way. Somewhat frustratingly, the trailer doesn’t give us a release date except to say it’s coming soon. But it does show you the kind of fast-paced, disorienting, and difficult combat that you’ll face in AAC. Yet if it’s a bit hectic to watch, it’s incredibly natural-feeling to play. I spent an hour of at GDC a couple years ago with a huge grin on my face as me and three other teammates ripped through level after level, before encountering a boss that we simply could not work out how to handle. If you play this on PC, though, I do recommend arranging it so that you can do some couch co-op. It gained a lot from having people all shouting at the screen in a gleeful panic.